Jeffrey Lewis & his band The Junkyard will open for Pulp at Radio City Music Hall in Manhattan on Wednesday, April 11. This mark Jeffrey Lewis & The Junkyard’s first show in NYC since they sold out the Mercury Lounge last November. The band will be joined by new member Kristen Andreasson (Uncle Earl/Sometimes Why), who will basically be debuting on stage with the Junkyard in front of what is probably their biggest-ever American concert. Yikes! Jeffrey’s last album “A Turn in the Dream-Songs,” his sixth for Rough Trade Records, was released last October and has been featured on Soundcheck and All Things Considered among other places. Jeffrey is just coming off a solo acoustic tour with Wooden Wand which saw him make stops all along the East Coast, including a special show (with Kimya Dawson, Daniel Johnston, and Built to Spill) at SXSW as part of the Brooklyn Vegan event for the release of Daniel Johnston’s multi media project Space Ducks. 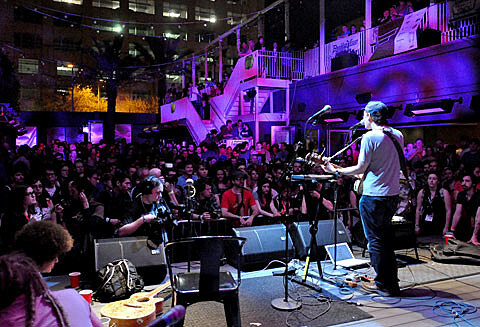 Mon May 7 – Cork, Ireland – Crane Lane Theater – (Phoenix St) Jeffrey Lewis solo acoustic, only Ireland show. May 9 – 14 – Jeffrey Lewis at the UTOPIA festival in Rouen, France – at the 106, featuring talks, art, music, and other events, check venue website for details. Sat June 2 – London, UK – Jeffrey Lewis & The Junkyard play Field Day Festival, in London’s Victoria Park, UK. Buy tix HERE. Sun June 3 – London, UK – Jeffrey Lewis & The Junkyard play Apple Cart Festival in Victoria Park, London UK (with Billy Bragg, Josie Long, and many more).